For past few years there has been no Christmas cake in my house down home, I suppose down to the fact people got sick of eating it. This year however its making a comeback, and its the first one I have made since I was 14 years of age. I remember in first year of secondary school Home Ecomomics around the end of November 1996 seeing Christmas cakes sitting on top of the cupboards in the Home Ec room. I thought this is great we get to make Christmas cakes in school! I knew I would love Home Economics. It was not until 3rd year though until I got the pleasure of making one. I loved making the cake, feeding it, marzipanning it and icing it, and the sense of danger ( ok well not danger but you get the point ) of being allowed bring in brandy every two weeks to feed the cake. Luckily the other lads didnt know that or they would try to gulp down the booze on me which was fairly common. I remember one lad who would bring in cans of Fosters and sup them down before 9 O'Clock in the common area or the time another lad brought in a bottle of Winters Tale sherry, everyone got a sup off of that, aaaah good times in St. Nessans. Anyhow I digress, this year I am determined to make a cake thats tastes good, is moist and people enjoy. 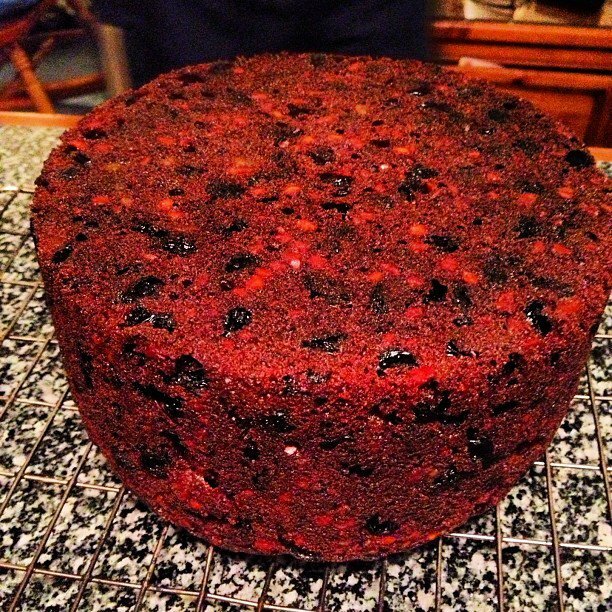 Christmas cake is always eaten around 11am on Christmas day in our house with maybe a small drink , my dad with his whisky or my mum with Sherry or Baileys. Steve would always like a piece after Christmas day tea simply for the icing and marzipan. This recipe below is Stage 1 - Pre Marzipan, now technically I should have made this weeks ago, like when me and Steve were kids the woman who would mind us after school would make her Christmas cakes in AUGUST! I am not that prepared. I will follow up over next two weeks with the Marzipan stage and Icing stage if I go down that route. Heat the oven to 150C/300F/Gas2. Grease a 20cm/8inch round or an 18cm/7inch square cake tin and line the bottom and sides with baking parchment. Sieve the flour, salt, mixed spice and cinnamon into a bowl. Cream the butter and the sugar in a large mixing bowl and then mix in the sugar, treacle, marmalade and vanilla essence until light and fluffy. Mix the eggs a little at a time into the mixture adding a tablespoon of flour mixture with the last amount. Fold in the remaining flour mixture until well mixed and then mix in the dried fruit, mixed peel, glace cherries and the almonds. Turn the mixture into the prepared tin and make a slight hollow in the centre. Bake in the oven for 3 hours and then test with a skewer. If not ready bake for up to another hour testing every 20 minutes until the skewer comes out clean. Remove from the oven and leave to cool in the tin for 15 minutes. Turn out on to a wire rack and leave to cool. Once cool, make a few holes in the cake with a skewer and pour over 3-4 tbsp of brandy. Let the brandy soak into the cake. Store the cake wrapped in foil and in an airtight tin or plastic container, holes side up. OPTIONAL: For a rich and moist cake, spoon over a few tablespoons of brandy every week until you are ready to ice and decorate your cake. I will update over the next three weeks in the lead up to Christmas.